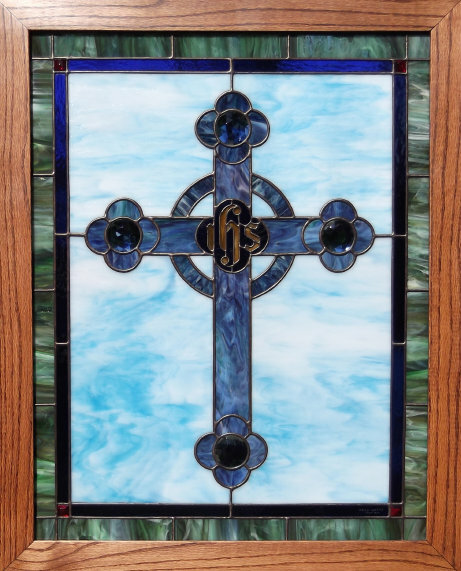 26 " x 32 1/4"
The first cross design was a fleur-de-lis cross, pictured on the right. I had some rather unique corner bevel sets and wanted to do a colored cross set in a clear waterglass background. Click on image for more info. This Jeweled Cross window was built in June, 2012, and contains 85 pieces of glass. It comes ready to hang in its 2" stained and varnished Red Oak frame. Back in 2003, I built 2 Celtic Crosses and resolved later to do some other cross designs. The Celtic Crosses are pictured to the right. Somehow "later" always seems to mean years later, so 9 years later in 2012, I decided to try some additional cross designs. I searched and researched crosses on the internet and really didn't find a design that I liked, so I had to just start drawing and figure out a design. I certainly am not an expert on crosses or Christian cross symbolism, so any ideas on better naming or describing this cross would be appreciated. For the Jeweled Cross, I had some 2" glass jewels that I thought would go perfect with the Kokomo glass blue sky background and the earthtone border. The entire window is opalescent glass....perfect for a window requiring privacy.